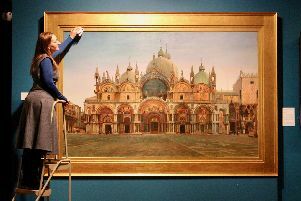 An immersive video experience taking inspiration from the genius of Leonardo da Vinci has opened at the Millennium Gallery as a curtain-raiser to a major exhibition marking the 500th anniversary of his death. The Vehicle of Nature, an installation by Sheffield-based international digital studio Universal Everything, is a 21st century response to the artist’s ground-breaking Studies of Flowing Water which will be on display in Leonardo da Vinci: A Life in Drawing opening next week. Matt Pyke, creative director at Universal Everything, “We have created a digital animated river across the floor of the Craft and Design Gallery taking inspiration from the local area, the rivers of Sheffield and the Peak District. It also features these very stylised boulder shapes integrated into the floor of the gallery space. “How it relates to the Leonardo show is that he did a lot of studies of water and water flows. What we have done is modern studies of water flows using the very latest cutting edge graphics technology. “I spent a lot of time out in the Peak District and walking through Sheffield with the dog and following rivers, things like that. But we used high end graphic technology and graphic simulation on powerful computers. Basically what we were looking at was with today’s technology what would Leonardo have done? Pike says that as an artist and designer he feels a strong affinity with da Vinci because he too is obsessed with the science behind things and about how movement in nature behaves. Universal Everything, with a studio in the Site Gallery, has three staff in Sheffield and another in London plus collaborators around the world. “Depending on the project it can be between four and 16 people working on it but it’s very much Sheffield based though,” says Pike. “This is the first project we have done in Sheffield in a long time and it has been fantastic to do something locally. We do a lot of projections such as the annual light show on Sydney Opera House. It was a very different scale but essentially the same artistic and design approach as this. The Vehicle of Nature by Universal Everything continues in the Craft and Design Gallery until May 26.